Before we ate at Patti's recently, we walked the property to view the gardens and peek into some of the shops. Keep in mind it was a cold, rainy day in March, but come late spring and summertime, these gardens are beautiful. Patti's does a wonderful job of planting (and maintaining) lots of plants and flowers. Above you see some of the garden sculpture in the flower beds. Here's a long shot of the same bed where you can see the beginnings of the spring bulbs peeking up. Patti's also has a great playground to keep the little one's busy before and after dinner. Also dotted around the property are these adorable butterfly chair/benches. These make for great picture places during the summer time. In the center of the property is a gazebo, which has been the site of many weddings and celebrations. I was here last summer when it was setup for an outdoor wedding and it was draped in white flowers and tulle. It was stunning. A small stream runs through the property. Here I've taken a picture of it while standing on a small bridge that allows you to cross over it. Here's a close up of the daffodils just about to burst open. Adjacent to the restaurant is this huge working water wheel. 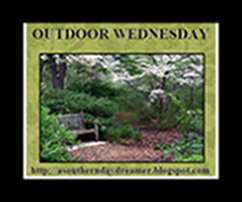 Today I am joining Outdoor Wednesday over at a southern day dreamer. Be sure to jump over there and visit more great outdoor posts. I love the butterfly bench! Patti's looks like a fascinating place to eat. What a fantastic place! I love the playground and all the lovely sculptures. Great photos too!